Pediatricians worldwide agree that consistent, proper nutritional intake is the most basic foundation for proper mental, physical and emotional development in children. However, research suggests that kids on average do not eat enough foods necessary to get the essential nutrients; their diets are often high in fats, sugar, artificial colors and preservatives, and low in the vital foods such as fruits and vegetables. Because children grow and develop so quickly, their bodies have a very high demand for complete nutrition; a consistent beneficial intake of all basic nutrients is important for optimal growth and development. Symmetry's Fruit-A-Mins provides a broad spectrum of whole foods, fruit and vegetable extracts-equivalent to one serving of fresh fruits and vegetables. Our unique formula is a comprehensive, delicious chewable vitamin, perfect for your growing child. Encourage your children to eat a balanced diet, and take Fruit-A-Mins daily to assure they are getting a solid nutritional base for a healthy, growing body. It's the solution both you and your child will love! Fruit-A-Mins was developed with several features to help improve growth rates, which sets it apart from many of the common children's chewables on the market today. A wide array of vitamins, minerals and antioxidants for optimal health. 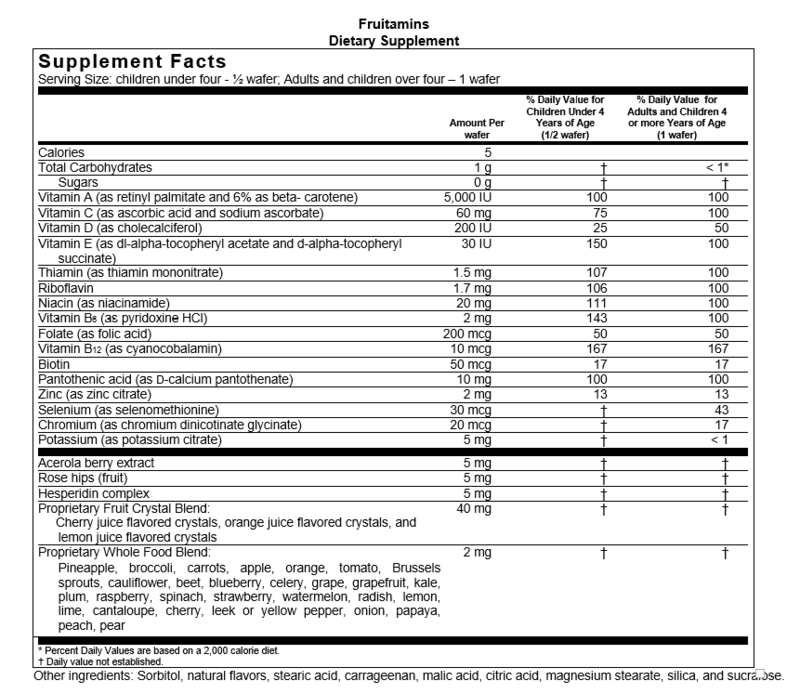 Nutrients equivalent to one serving of fruits and vegetables. Delicious taste that comes from Symmetry's exclusive fruit crystal blend; kids love the sweet, tart flavor. NO artificial sweeteners, coloring or preservatives of ANY kind.